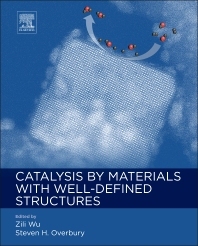 Catalysis by Materials with Well-Defined Structures examines the latest developments in the use of model systems in fundamental catalytic science. A team of prominent experts provides authoritative, first-hand information, helping readers better understand heterogeneous catalysis by utilizing model catalysts based on uniformly nanostructured materials. The text addresses topics and issues related to material synthesis, characterization, catalytic reactions, surface chemistry, mechanism, and theoretical modeling, and features a comprehensive review of recent advances in catalytic studies on nanomaterials with well-defined structures, including nanoshaped metals and metal oxides, nanoclusters, and single sites in the areas of heterogeneous thermal catalysis, photocatalysis, and electrocatalysis. Academic researchers, industrial professionals in catalysis science, inorganic and physical chemistry, chemical engineering, material science, and physics. Graduate and undergraduate students in catalysis, material science, chemistry and chemical engineering. Dr. Zili Wu is currently a Research & Development Staff member at Chemical Science Division and Center for Nanophase Materials Sciences of Oak Ridge National Laboratory. After his PhD in physical chemistry at Dalian Institute of Chemical Physics in 2001, he spent over 3 years at Northwestern University as a postdoctoral associate. Dr. Wu has over 15-year experiences in heterogeneous catalysis, applied spectroscopy and nanomaterial synthesis. His research interests lie in the fundamental understanding of catalytically active sites on the surfaces and interfaces involved in traditional catalysis, photocatalysis and electrocatalysis, establishing relationships in catalytic solids as a function of time and space, using in situ and operando characterization methods, and fabricating nanomaterials with well-defined structures. His current research activities include: i). Investigation on the shape effect of oxide materials in catalysis: nanoshaped ceria as catalyst and catalyst support for redox and acid-base reactions; ii) Understanding fluid-solid interface phenomenon in electrocatalysis and photoelectrocatalysis; iii). Catalysis by low-dimensional materials. He is an active ACS member and has organized four ACS Symposia in the area of fundamental catalysis. Steven H. Overbury received a PhD in Physical Chemistry in 1976 from University of California, Berkeley, where he was advised by Prof. Gabor Somorjai. He then went to Oak Ridge National Laboratory where he has been since. He is currently Distinguished Research Staff and leads the Surface Chemistry and Heterogeneous Catalysis group within the Chemical Sciences Division at ORNL, has been a task leader in Nanocatalysis at ORNL’s Center for Nanophase Materials Sciences, and is currently a thrust leader in the FIRST Center.. His research interests are in the area of surface chemistry and catalysis including Au catalysis, catalysis by nanostructure carbon, and structure dependence in catalysis of oxygenates on CeO2 surfaces and nanoparticles, especially with respect to effect of metal-support interactions and in structure-reactivity relationships. His professional activities have included Southeastern Catalysis Society (Director), ACS Symposium Co-organizer, Organizer, Workshop on Neutrons for Catalysis, Editorial board for Catalysis Letters, Catalysis Communications, Topic in Catalysis, External Advisory Committee for Institute for Catalysis and Energy Processes, Northwestern Univ., recipient of Battelle S&T Challenges Award, Martin Marietta Energy System Publication Award, and Martin Marietta Energy System Technical Achievement Award. He has led projects with Tennessee Eastman and participated in a personnel exchange program with Phillips Petroleum Research Laboratory.